Sipadan Inn is a comfortable budget hotel located in Semporna. 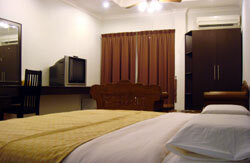 Sipadan Inn features en-suite rooms with A/C, Cable TV and Free Wifi. Room types are Standard double and twin, Family rooms and Superior rooms.